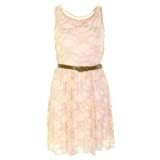 Women’s Belted Lace Shift Skater Sleeveless Dress is available in different colors. Stun your personality with this wonderful collection!! !